Those magnificent blooms were irresistible. 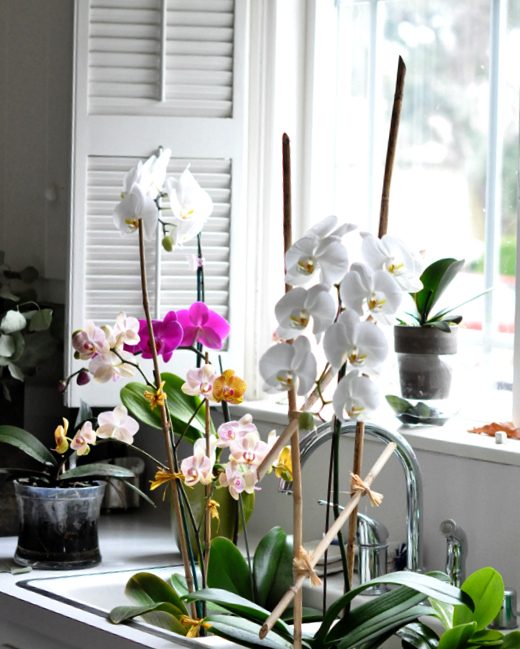 So you purchased your first orchid, brought it home, and now what do you do! Orchids don't need a lot of attention and they're tougher than you think. In fact the quickest way to kill an orchid is over doing it. So don't try to make everything perfect - your plant will be just fine. Where Should I Put My New Orchid? 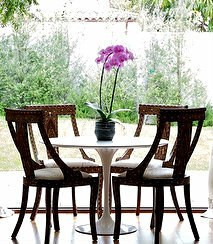 Display your new orchid wherever it look best. If your new plant is flowering, display it wherever it looks best; kitchen counter, dining room table, etc.. Your plant is in its "Blooming Season" and it has all the energy it needs to push out more flowers and it doesn't need sun at this point. In fact, flowers last longer away from direct sun. Cool temperatures also make flowers last longer - think of how a florist keeps their flowers fresh in a cooler. How Do I Water My New Plant? Is it too wet? Is it too dry? What holds water .... what doesn't? Watering orchids can be a mystery! Sidebar: Our hydroponic system takes all the guesswork out of watering! A water gauge tells you when and how much to water. We have to wait until your plant is finished blooming before we can transplant it hydroponics however. Correct watering means establishing a definite wet/dry cycle for your plant. So, when you water, you can't over do it. Knowing how long to wait between waterings is the challenge. The best method I have found for watering (no matter what it's growing in) is soaking the plant in the sink for a couple of hours. Don't worry, you can't over do it. First, make sure the grow pot has a hole in the bottom for drainage. If your plant is in a decorative container, it should have an inner grow pot. Lift the plant (and grow pot) from the decorative container and take it to the sink. Water throughly. Pour water over the roots until it runs out the bottom of the pot. Repeat a second time. You can even let your plant sit in water for a couple of hours. Never, ever allow your plant to be sittting in water for days and days however. After a thorough watering, put your plant back in it's decorative container and return it to its display spot. Here comes the tricky part - wait until your plant is completely dry before rewatering. How long this takes can vary from a couple of days to 2-3 weeks depending on what type of media your orchid is growing in. 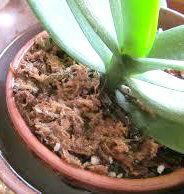 Orchids growing in bark (or stuff that looks like bark) will probably need water every 5-7 days. Orchids growing in moss need water only once every two weeks! 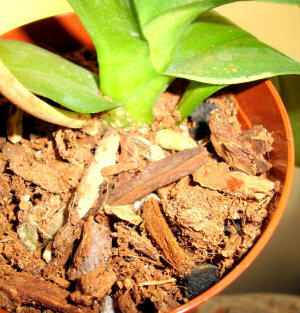 As you can see, it takes a "green thumb" to water orchids growing in traditional media. Don't worry, watering will be easy with our Hydroponic System. We eliminate all those mysterious potting materials and our system even has a water gauge that tells you when (and how much) to water! Wait until flowering is finished before transplanting into our hydroponic system however. Don't expect your plant to keep blooming forever. Fading blooms that shrivel up and fall off does not mean your plant is dying, it's simply completing its bloom cycle. Some flowers last only a week, others last up to 2 months. 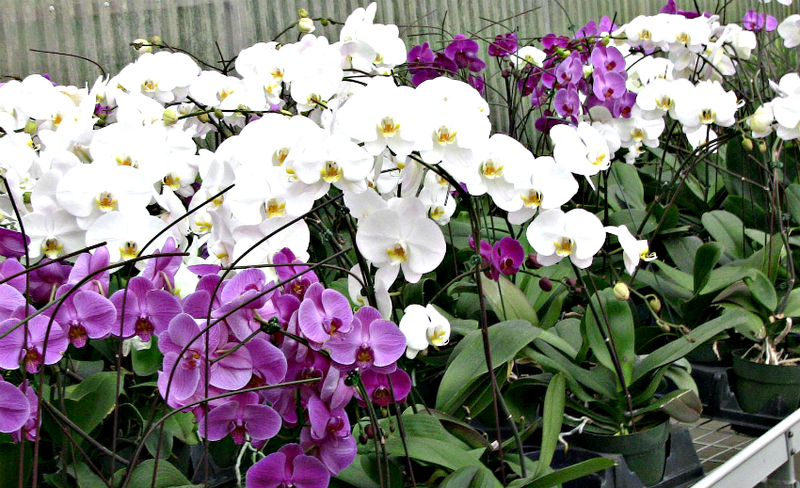 It depends on the type of orchid and how long it's been blooming before you bought it. Occasionally, new orchids will drop all their flowers the moment you bring them home. That's certainly disappointing but it doesn't mean your plant is dying. It's had a long journey from the grower to your house (sometimes half way around the world!) and it's probably endured many difficult situations along the way. Your new plant is simply having a hard time adjusting. In this case, cut back the flower stem (all the way back to the base of the plant) to start the growing cycle all over. When Will My Plant Bloom Again? That depends on what type of orchid it is. Phalaenopsis (Moth Orchids) flower once a year, usually in winter or early spring. Dendrobium, Cattleya, and Oncidium bloom 1-2 times a year. Some bloom in winter, others bloom in summer. To get your new plant to bloom again is going to take a little know how. Don't worry, it's not difficult - we'll show you know what to do.